Free download Neo Geo Cup 98 The Road to the Victory game. It is very popular football game for neo geo. This Neo Geo Cup 98 football game can be played on your PC. Neo Geo Cup 98 is free for you to play. Neo Geo Cup 98 The Road to the Victory game is very easy to download and play. There is no need to install this game. Just download the compressed file and extract it, then you are ready to play the game. There are different groups in the football game. You can select any team of your choice from the specified groups. These groups are Europe A, B, C, Africa, Americas, South America, Asia A and Asia B. You have to select your desired team from the group of countries. After selecting a group, you have to select the team to play. Then you have to enter your name. In next step, you have to select power-up mode. Now it’s time to select Tournament Mode. You can select World Tournament, Europe Tournament, South America Tournament, Americas Tournament, Africa Tournament and Asia Tournament. Then the qualifying round will be started according to your tournament. You have to use arrow buttons for movement and A, B, C buttons for action. You have to make goal towards the opposite site. Try to defend and make goal to win the match. Moreover, you can change them from Game>Redifine Keys> Redifine Keys Player 1. 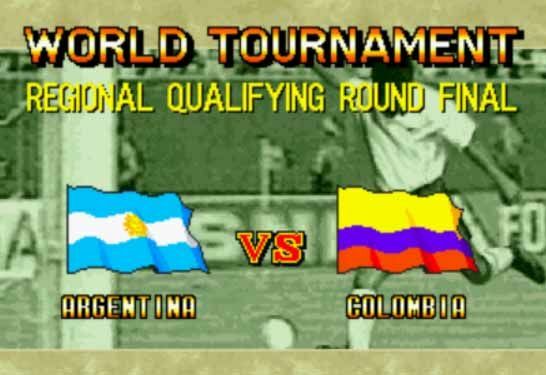 Now you are ready to enjoy the football or soccer action of Neo Geo Cup 98: The Road to The Victory game on your PC.